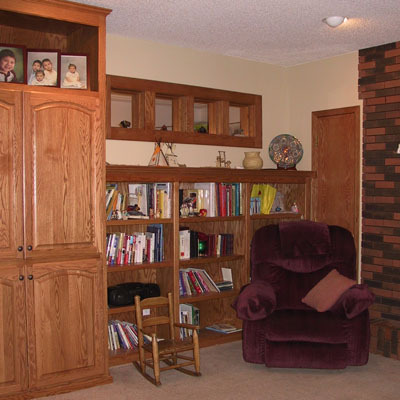 The lower datum line established by the bookshelf creates a cozy, smaller scaled corner within this large family gathering space. The design of the cabinets also incorporates four little windows (one for each of their children) that connect to the south-facing dining room. Having light coming in from two sides makes the whole room feel more open and also provides an interesting visual connection to another part of the house, making the "cave" description obsolete.